The new orchard meadow has been a constant source of delight, awe and wonder from my very own kitchen window this spring and summer. With growing joy, I watched the plants beginning to flower that set seed last year. Their pollen and nectar attracted many solitary bees and bumblebees, including the fascinating Wool-carder Bee for the first time. Meadow butterflies such as Essex Skipper, Common Blue, Gatekeeper, Small, Large and Green-veined White nectared on wildflowers Common Knapweed, Field Scabious and the non-native Purple Toadflax which has escaped into this meadow. I saw a Large White butterfly depositing eggs on the underside of a Garlic Mustard leaf. Amongst the mass of Wild Marjoram which is establishing itself, I spotted what initially I thought was Field Woundwort, but then realised it was Wild Basil – such a beautiful unexpected arrival which has attracted many pollinators. Yesterday, I noticed a Field Scabious which has just flowered amidst the Wild Marjoram and is the first to grow from seed on this new meadow. This find filled me with so much happiness: the soil fertility is low enough, so more should set seed! As I returned home from a walk this week, I surprised two Goldfinches teasing seeds from Common Knapweed close to my front door. My tiny meadow provides food for so many species and yet Knapweed has also given me the dazzlingly uplifting ‘Last glorious fireworks of Summer’. We are only scratching the surface when we look at a wildflower meadow. 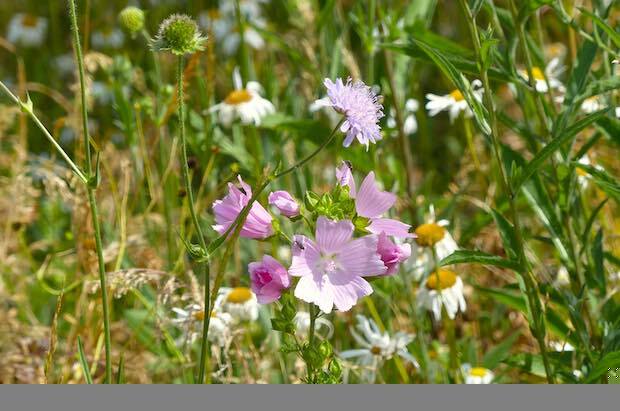 There is so much complexity in the way meadows and all ecosystems function. Some of the species that have co-evolved with them will remain beyond our understanding. A butterfly chrysalis comes to mind as a shining example of a completely mystifying process that we will never unravel. We could lose Common Knapweed and Field Scabious without benefiting from their freely given curative properties that our ancestors were aware of and used. These wildflowers may offer new cures in the future. Indigenous people have been using medicinal cures provided by rainforest plants for thousands of years. We must never let life-giving, highly biodiverse, native wildflowers disappear from our shores. Their importance is extremely high yet they are very fragile and so easily destroyed. Meadows generally have no statutory protection and can be damaged by a single application of nitrogen fertiliser. A study by the European Commission found that “…pollinators visited a greater variety of plants in urban environments due to the high number of non-native species that exist in cities compared to rural sites. However, this also means the insects could be acting as poorer pollinators, as they carry mixed loads of pollen between unrelated species.” The research found that more should be done to improve the quality of urban spaces for pollinators, such as more trees and wildflower meadows in cities, leaving grass areas uncut, and pesticide-free small-scale urban agriculture. You can help pollinators by planting wildflowers in your borders, or sowing a mini wildflower meadow; sowing field margins, or a large meadow with wildflowers if you are fortunate enough to have farmland, or own acres of land. You can also help butterflies by including meadow grasses. We have lots of advice on our Get Started page: Where to buy native wildflower seeds and meadow grasses. If you are a beginner with a small plot, look at Seedball’s website and check out UK Butterflies to learn how you can best help our ailing butterflies. I have traditionally cut the meadow (to 2 inches – a height which helps wildflowers to outcompete grasses) at the end of August. This year the meadow was cut on St Swithin’s Day (15th July) due to prolonged dry sunny weather causing the Yellow Rattle and other flowers to set seed much earlier. Grassland expert Miles King has advised that starting mosaic cuts as early as June, will prevent the coarser grasses from becoming dominant later in the season. Leaving an uncut area after the main cut will also give pollinators flowering plants into autumn. There are also species that need more “tussocky” grassland so areas should be left uncut to provid overwintering habitat, too. So next year, I will be reporting on the successes of the meadow’s mosaic cut. One third of the Orchard Meadow will remain uncut overwinter which is a mixture of tussocky grassland and an area of wildflowers with minimal grasses. 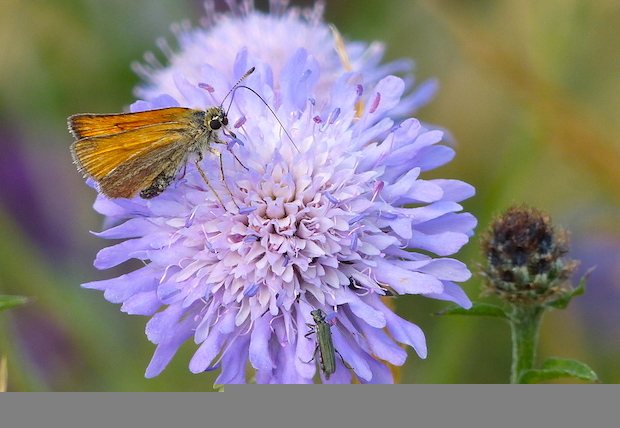 I have recently collected some Common and Greater Knapweed, Field and Small Scabious, Wild Carrot, Birdsfoot Trefoil, Ladys Bedstraw and Meadow Vetchling seeds to sow in the meadow and orchard meadow. Before the mini meadow was cut, I collected the Yellow Rattle and Cowslip seeds. It is always an exciting time of year, as I wonder what I will find when the meadow begins to grow next year. Will a Bee Orchid or Pyramidal Orchid spring up? Their seed is like dust and it is entirely possible that they could arrive here from local sites on the wind and set seed. My tiny meadow provides food for so many species and yet Knapweed has also given me the dazzlingly uplifting ‘Last glorious fireworks of Summer’. We hope that this has inspired you to start your own wildflower projects and not to use pesticides, but to let biodiversity control the pests. We look forward to hearing all about your meadow projects, no matter how small, on NearbyWild on Twitter and Facebook. We’d love to see your photos including the wildlife that will undoubtedly find them.